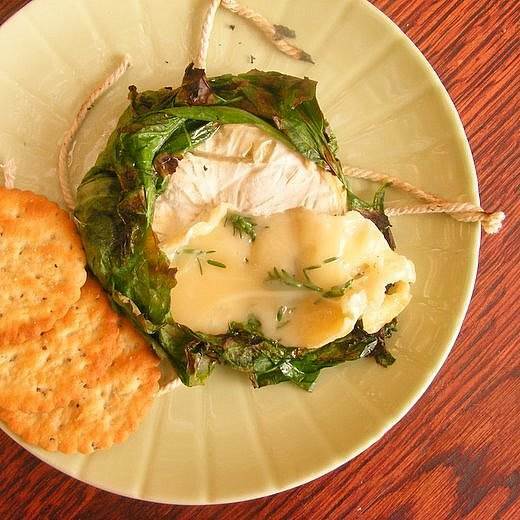 Soaked in wine overnight, then flavoured with herbs and garlic, these little cheeses are wrapped in green leaves, tied with string and grilled over hot coals until the cheese has liquefied. This is a great warm-up snack for a braai [barbeque]: put them on at the same time as the meat (they take only a few minutes to cook) and then pass them around with a pile of crisps or salty crackers while you finish cooking the steaks. 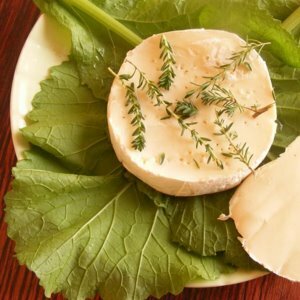 You can flavour these cheeses with anything you like - I used thyme and garlic - and any large, fresh, flexible leaf will do as a wrapping: fig leaves, spinach leaves, banana leaves, beetroot greens, or even a robust lettuce leaf. (Here I used mustard greens, which grow like weeds in containers in my garden). Don't worry about the leaves catching fire: their moisture prevents them from charring too quickly. By the time they've blackened at the edges, the cheese will have collapsed into a herby goo. This, I might add, is the only dish that I've so far managed to cook successfully on my brand-new, super-duper, Taj Mahal of a braai-and-pizza oven. I fired up the new braai on Sunday for the first time, partly because I'd laid my hands on a beautiful slab of fresh tuna, straight off a fishing boat, but also because I wanted to road-test my new grid. This grid, which I asked a local ironsmith to make, has a cunning feature: a third of the total space is covered by a removable double-decker section. This is designed, first, to keep food hot, and second to allow slow-cooking meat (such as chicken) to finish off at its own pace. The grid and its upper storey worked very well; the tuna steaks, on the other hand, were... um.... well, they were deliciously, spankingly fresh, but they overcooked in a matter of minutes, welding themselves so resolutely to the new and shining grid that I started hunting for a crowbar. Thank goodness for the cheese. The day before you want to braai the cheeses (or at least six hours in advance), use a sharp knife to slice off the top layer of rind, removing about 2mm. Put the cheeses, and the sliced-off rinds, into a shallow dish. Prick holes, using a fork, all over the soft upper surfaces of the cheeses. Mix together the wine, olive oil and crushed garlic, and pour the mixture over the cheeses. Cover with cling film and set aside in a cool place. Turn the cheeses once or twice while they marinate. Soak 1.5 metres of string in cold water ten minutes. Remove any large, stiff stalks from the leaves. Place two leaves, crosswise, on your counter top. Place a wheel of cheese on top. Drizzle some of the marinade over the cheese, top with a few sprigs of thyme, season with salt and pepper, and cover with the sliced-off 'lid' of rind. Place another leaf on top. Cut off a 40-cm length of wet string and slide it under the bottom-most leaf. 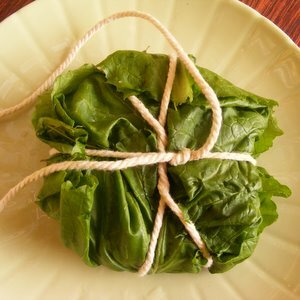 Gather the edges of the leaves up into a parcel, pleating and tucking as you go, and secure it by knotting the string around it in six 'spokes' (see picture, left.) Don't worry if the parcel is scruffy: as long as there are no gaping holes, your cheese is safe. Repeat the process with the remaining cheeses. Place the parcels over hot coals, face down, for about three minutes, or until the top of the parcel is browned. Before the cheese melts completely, flip over the parcel, using a spatula, and allow the underside to cook for another three to five minutes (depending on the heat of your coals). The very instant you see cheese seeping from the parcel, it's ready. Serve immediately. Juno, you've gone and outdone yourself. I really & truly think it just doesn't get better than this. Cheese & booze in one dish?? Bring it on. This looks too gorgeous and tempting for words! Hope your pizza oven gets over its teething pains. My husband is also set on us building one, one day, so let us know how things go. I agree with Marisa, it does not get much better than this.....brilliant! Great!!! Thanks for sharing from Poland! Thank you my friends, as ever, for the kind comments.